Pattonville honors "Most Valuable Pirates"
Faculty members at Pattonville High School recently presented their MVP (Most Valuable Pirate) Awards to more than 130 students in grades nine through 12. Each staff member selected one outstanding student to receive an MVP medallion based on criteria of their own choosing, such as academics, effort, positive influence and/or rising above adversity. The MVP Awards program was sponsored by the school’s Renaissance program, which recognizes academic performance, attendance and citizenship. Yohanes Mulat received his fourth consecutive MVP award during the ceremony, and Josie O'Dell and Emily Spurlock received their third MVP awards. Seventeen students were recognized with a second MVP award: Madelyn Adams, Kendall Battle, Kylie Boswell, Makyla Boyd, Summer Davis, Isabel DiSalvo, Lucas Eslinger, Ameer Forrest-Mayweather, Lucas Gibson, Najee Glass, Christie Jiang, Carter Kennedy, Savannah McAllister, Molly Morris, Samuel Risenhoover, Susana Solorzano Hidalgo and Alec Sword. 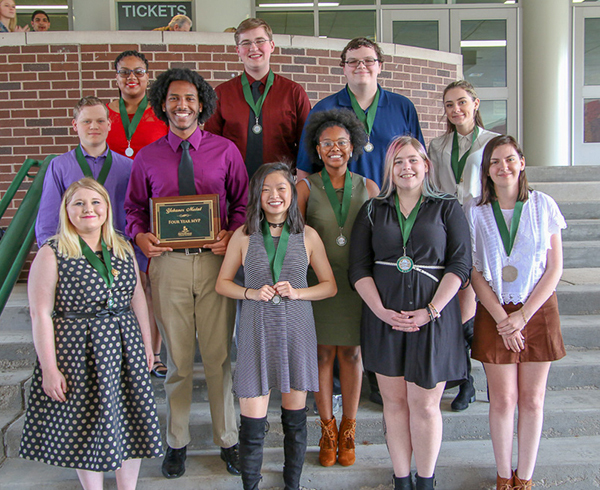 The following students were also recognized with their first MVP Award: Desire' Adams, Nash Albers, Blake Alicea, Aisha Alvi, Leslie Azwell, Gregory Bahr, Zackery Baldwin, Teidrick Banks, Eric Barcenas, Christian Baugher, Brock Beins, Madison Blair, Maya Blumenthal, Shawnee Boswell, Ethan Brown, Timmesha Brown, Slenda Caldwell, Esha Chopra, Michael Cobb-Schultz, Nolan Cobbs, Joseph Coffman, Jada Cosby, Marquise Cousins, Ayreanna Crowder, Rafael Crumpton, Eden Dadi, Celsey Davis, Samantha Esteep, Matthew Feldewerth, Lauren Fisher, Aaron Ford-Givance, Gabriel Furr, Kori Gibbons, Fabian Grabski, Dorian Green, Bria Griffith, Carter Guetschow, Shaleen Gupta, Kyle Haveland, Zoey Ham, Braden Hanford, Molly Hanford, Laura Harder, Mya Harris, India Henry, Devin Hill, Gisele Hinojosa, Angelena Hlinak, Emma Hohenstein, Samuel Hopper, Kyle Hubbs, Raven Hughes, Katie Hutchison-DiBello, Mohammad Islam, Tabatha Jackson, Madison Jennings, Sarah Johnson, Rebecca Johnston, Sierra Jones, Makayla Jones-Scott, Joseph Kasprzyk, Jayla Kelley, Joshua Killian, Adrian Killingsworth, Chasity Kinard, Micah Lee, Devon Linhardt, Titalia Long, Alexander Lopez, Stephanie Lopez, Ethan Lupicki-Dickason, Nadia Maddex, Victoria Malone, JaMya McAlister, Shawn McDonald, Ashley McFadden, James McMahon, Adam Mitchell, Maxwell Moore, Stephen Ndungu, Helen Nelson, Madina Nigmonjonova, Grace Ohlsen, Michael Pieper, William Pirrie, Karlianna Pruitt, Aleen Qondah, Alyssa Quick, Shelby Quick, Joseph Ramirez Hazel, Brenden Reynolds, Joshua Royal, Lorelei Ryan, Erika Sanchez, Terrell Sanderson, Souleymane Sarr, Brianna Sasser, Derrick Sawyer-Rowe, Hannah Schamber, Timothy Scott, Dylan Sisk, Shakyah Smith, Andrew Snider, Destiny Sparks, Joreail Sparks, Wesley Spitzmiller, Dakari Streeter, Emma Stubblefield, Mahmood Syed, Philip Tso, Dayna Union, Maiya Varner, Sarah Vineyard, Rachael Vitale, Tony Washington, Jordan Weaver, Alana Williams, Jaden Williams, Samiia Williams, Jared Wilmas, Reece Wolz, Alexis Wysocki, Elleni Yeshiwas, Fahad Yousif and Devin Zahner. Shown are students who earned multiple MVP awards, including Yohanes Mulat (with plaque) who has received the award all four years of high school.